Walking through the halls I have wondered why there was the distinct smell of deliciousness in the air after school hours. 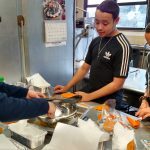 If you looked into the kitchen you would have seen the Eighth Grade Food Club once again learning new cooking afeteria recently, you might skills. 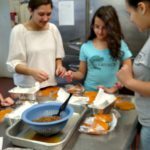 This time under the direction of Mrs. Shumny they learned how to prepare her famous empanadas. She gave them step by step directions to prepare the filling for the shells. After all of the members has constructed their own empanadas, Mrs. Shumny fried them so were able to take them home to share with their family. The club members are now looking forward to spending time with Sister Yosaphata to learn how to make pierogis.